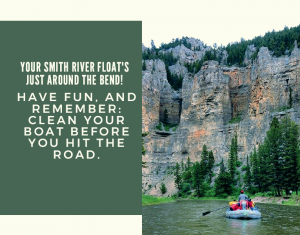 In 2010, Montana Fish, Wildlife & Parks worked with ISAN to create invasive species outreach materials to influence the behavior of Smith River floaters about invasive species through the permitting process. The program utilized three primary outreach contact methods. The first is the inclusion of information about AIS and protecting the Smith in the floater packet sent to all permittees. The second contact comes via a post card mailed to the individual and timed to arrive about a week before their float. The final outreach contact occurs at the Camp Baker put in where all floaters are required to receive an informational briefing from a Smith River Ranger.